Skirt at W Hotel Singapore has been winning raved reviews since opening a few months ago, so I had to check it out to find out for myself. Indeed, the restaurant lives up to the hype, and it has rocketed to become my favourite steak restaurant in Singapore. 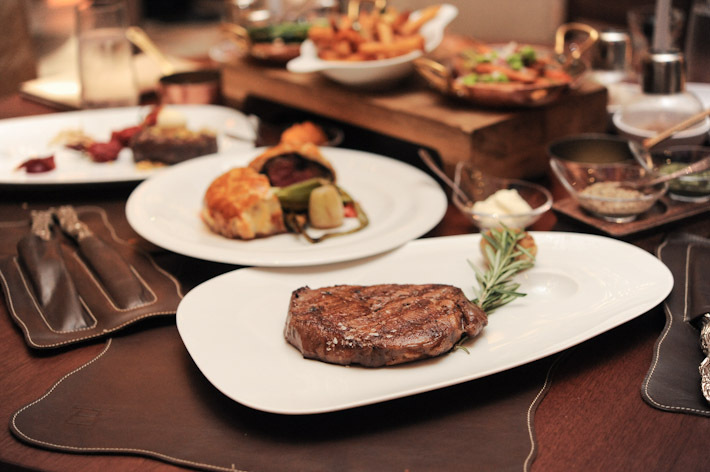 It is a top-class steakhouse with middle-range pricing. 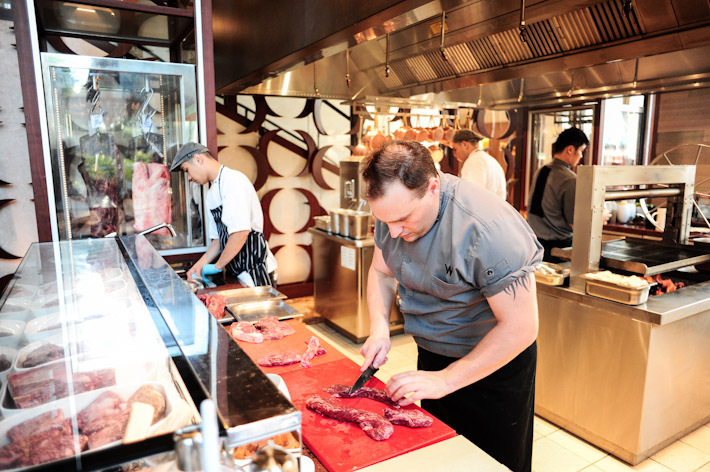 At the entrance of the restaurant, there are “aging cabinets” which contain choice meats alongside specialty cuts of milk-fed lamb and venison. For those who like to have a drink before having dinner, the bar tucked at one end of the restaurant offers bespoke cocktails. The restaurant itself is elegant and stunning. 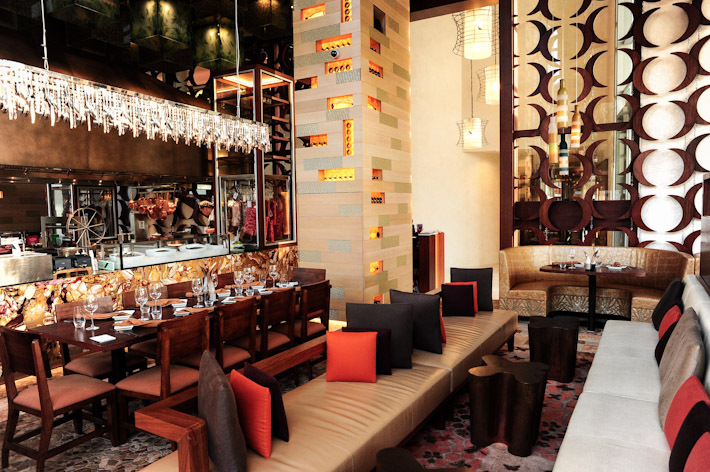 It is classy, yet not pretentious; it gives off a cool and hip vibe effortlessly. We started our meal with the Tuna Tartar ($28) with avocado and wasabi; and Iberico Pork Belly with Bean Cassoulet ($20). The former was decent, but unremarkable. The latter saw chunks of pork belly with white beans and carrot in a pork broth made with pork loin and spices like star anise, cinnamon and honey. 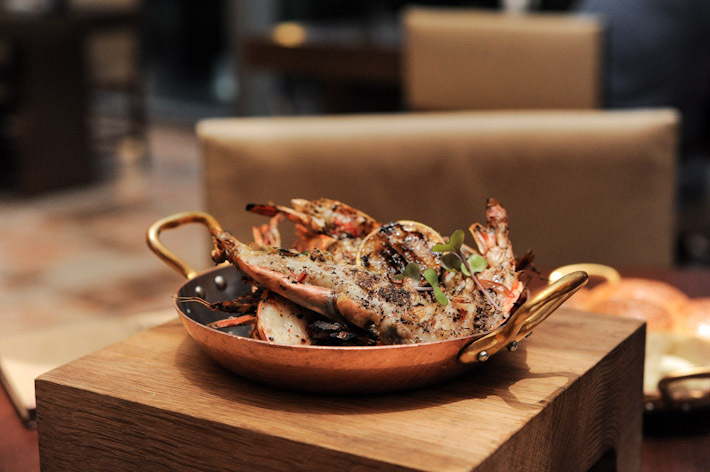 Next, we had the delightful Grilled King Prawns ($25) from the grilled picadas menu. Fat, juicy and fresh prawns were split and generously peppered, then put to grill, producing a hint of smokiness and a lot of sweetness for our indulgence. 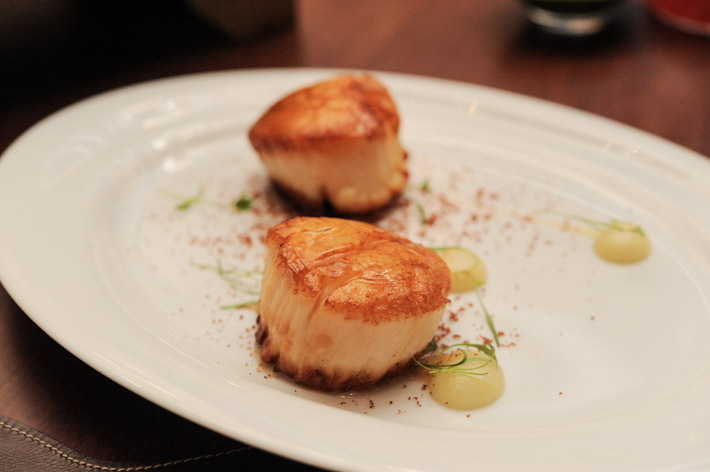 The Seared US Scallops ($35) – with dashi, apple and Jamon – are what dreams are made of. Plump and meat, they were the easily the biggest scallops I have ever had. This was my favourite starter. And the highlight of our meal – steaks. Skirt has an impressive selection sourced from Australia and USA: Blackmore Australian Full Blood 9+ Wagyu, Tajima Australian Crossbred Wagyu, Creekstone Farms USDA Corn-fed Black Angus, Cape Grim Australian Grass-fed Angus, and Donald Russell Irish Grass-fed Aberdeen Angus. 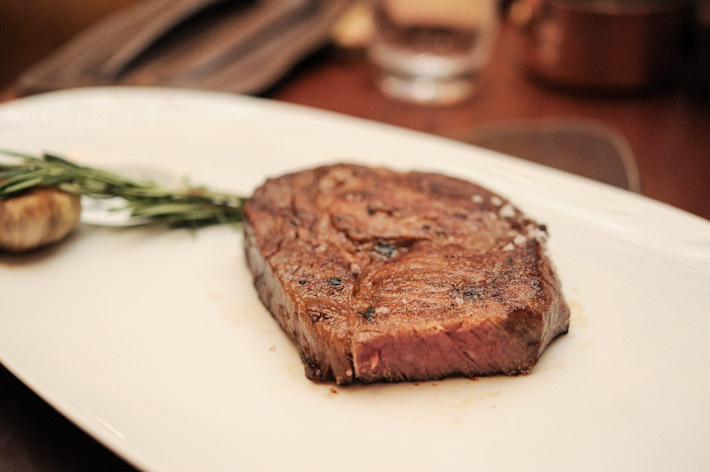 Prices range from $35++ to $158++, and most of the steaks are priced below $60. The 250g Blackmore Wagyu Skirt Steak ($48) is one of the most popular options on the menu. We had the Tajima Australian Crossbred Wagyu, a 25 Day Dry Aged Ribeye ($70/140 for 250g/500g). It was a good piece of meat prepared at the highest level. We enjoyed every bite. The other steak that we tried was the chef’s special ‘Skirt Steak Sandwich’ – a Blackmore Australian Full Blood 9+ Wagyu Tenderloin served with beetroot and Jamon. This was an off-the-menu item which is reserved for regulars and those in-the-know. If you plan to try this dish at your next visit to Skirt, inform the chef and I am sure they will be glad to prepare it for you. And oh, did I mention about the sides and condiments? Unlike other steakhouses where the sides tend to be over-priced, the ones here are decently priced between $5-12. The steaks are served with seven condiments – Red Wine & Marrow Sauce, Peppercorn Sauce, Horseradish Cream, Bloody Mary Butter, Cherry Tomato Relish, Blood Orange and Tarragon Bearnaise Red Chimichurri and three kinds of mustard. In addition, they also come with six different types of salt: garlic salt, beef salt, rosemary salt, Hawaiian red salt and smoke salt. While steaks are the main focus at Skirt, the restaurant also offers quite a few main courses on the menu. The Braised Dorper Lamb Leg ($45), Dover Sole ($50), Cinnamon Poached Maine Lobster ($85) and Iberico Pork Skirt ($40) are tempting options. 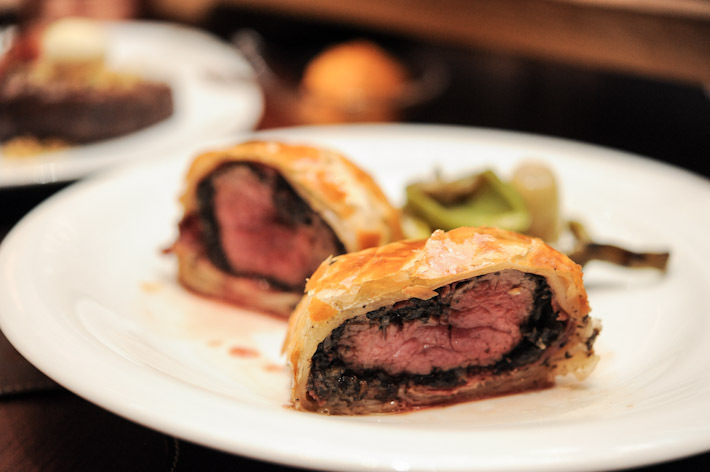 We went for Skirt Beef Wellington ($58) because not many restaurants in town do this dish well. Beef tenderloin coated with pate encased in a crispy puff pastry; it was faultless. That said, while Skirt’s rendition was executed perfectly, I am not sure if I would pay for this. I am not a fan of Beef Wellington to begin with. Moreover, some of the steaks on the menu are more appealing and affordable. 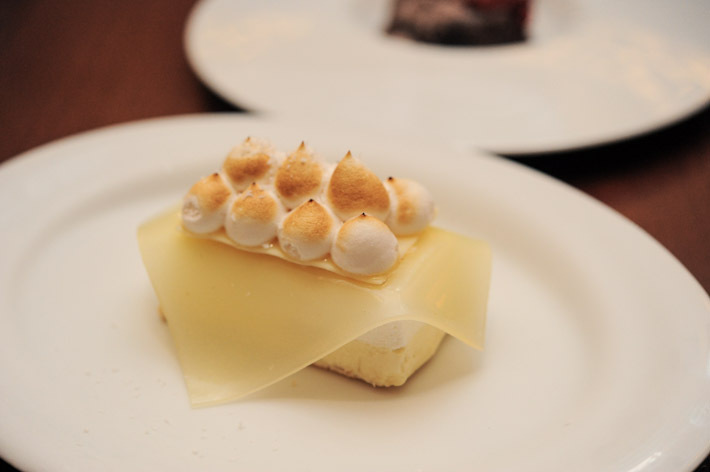 The Toasted Honey Meringue ($18) came highly recommended and it did not disappoint. It came in the form of coconut and pineapple ice cream on a digestive biscuit base, topped with a beautiful sheet of pineapple jelly and meringue. We also had a Warm Venezuelan Chocolate Mud Cake ($18) with poached wild strawberry and tarragon. Other desserts include: White Chocolate Parfait ($18), Chocolate Forest Cake ($18) and Crepes with Dulce de Leche and Chocolate Lava ($15). A meal at Skirt need not be expensive if you order wisely. Their signature 250g Skirt Steak is only $48, and other affordable cuts include a 250g Irish Grass-fed Sirloin ($35), and the 250g Cape Grim Australian Ribeye ($42). 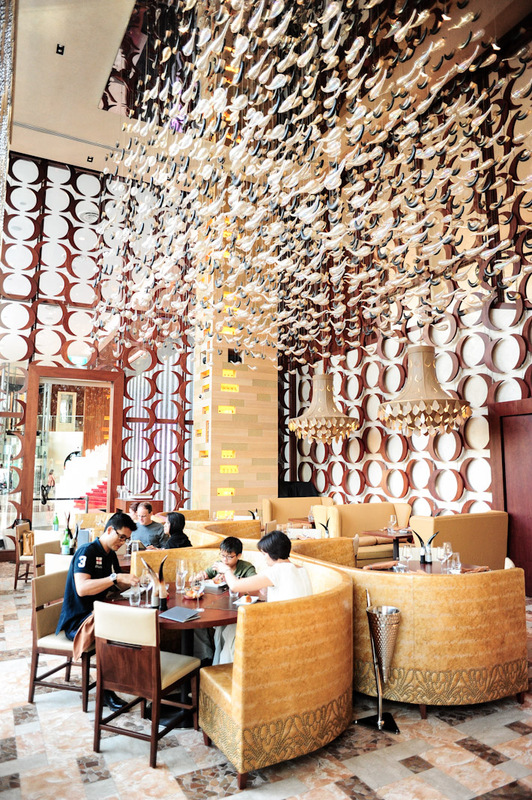 In conclusion: if you love steaks, you must make a trip to Skirt at W Hotel Singapore. I love that they have ageing cabinets! I haven’t made it to the W yet but will do in the next couple of weeks. What do you think of the W bar? was this a paid tasting sponsored by the restaurant?